Yesterday has me thinking about equity and access. I had two very different experiences while listening to the featured speakers. Dr. Leah Buechley was the keynote speaker yesterday. 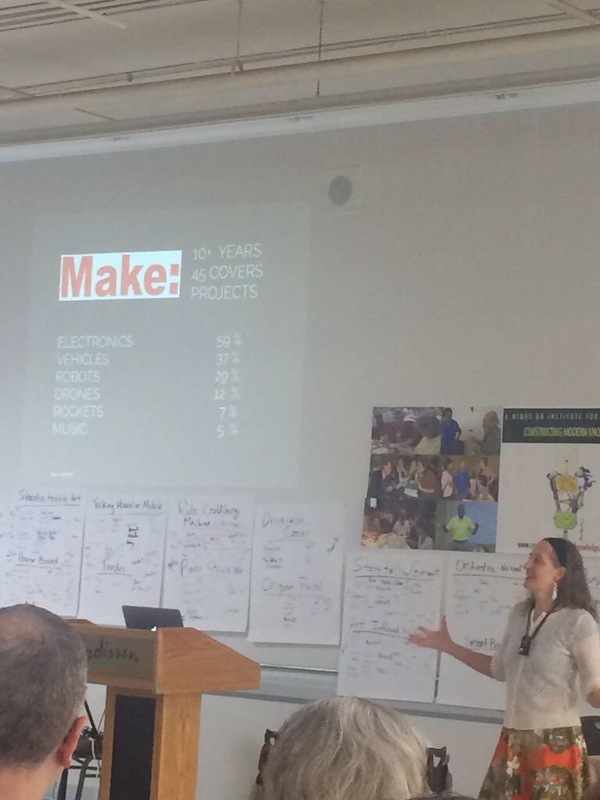 A former MIT professor and the inventor of the LilyPad Arduino tool kit, she speaks as an insider about those who are excluded from the maker movement. She analyzed the covers of Make Magazine since it’s beginning 10+years ago. And of the 44 covers there have been 41 people featured. Of those 41, 85% are men and boys. There has not been one African American on the cover of Make Magazine. So who is a maker, by the visual record that Make promulgates? White men. And what do they make? Robots. She talked about different kinds of making – of what are considered female “crafts” – and she reminded us of the complexities of geometric design on pottery, the fractals of design, the hyperbolic math of the crocheted coral reef, the transformational geometry of cornrow braiding. These are “made.” We make things as a part of human life. We are born making and creating. This is what we teach out of students. It’s not that I want them all to be able to make a robot – I want every one of my students to make meaning and the tools needed to solve the problems facing them. We boarded the buses and went to the MIT media lab – the 6th floor presentation space is really sterile – literally white – and there we listened to Dr. Sherry Lassiter, director of the Fab Lab project. The mission of the Fab Foundation is great – to put tools to make almost anything in the hands of everyone – but it takes a lot of money to set up a Fab Lab – and those tools are not going to be in the hands of everyone for a long time. Digital imaging, three-d printing, CAD, laser cutting – all amazing and so inspirational – and yet… somehow, so disconnected. Dr. Buechley expressed concern about the call to have “every child a Maker.” How can we trust the education of our children to a group of people that does not see people who are not like themselves? This past year I had the pleasure of seeing Liz Gerber, professor of design at Northwestern, work with my seventh graders. She emphasized two things that I remind myself of frequently – make MANY Low Fidelity prototypes, and have a bias toward action. Don’t just sit there! Make something – of cardboard and pipe cleaners and paper plates and plastic cups. You should know that a design is going to work before it becomes a three-d printed thing because you have field tested many low-fi beta designs. So, back to my project. With Liz Gerber’s words in my head, I need to make something.